Even if you have only been interested in saltwater reef tank a few days, you have heard of live rock. 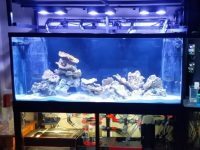 On some message board or in a conversation in your local fish store – somewhere, someone has told you you need live rock to maintain a healthy marine aquarium. Live rock is a staple of a successful marine aquarium. 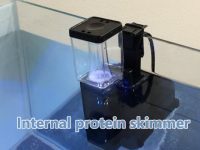 It is the best aquarium filter you will ever buy. It is a home for marine life, a source of food, and can be a beautiful addition to your tank. But what exactly is live rock and how can rock be alive? Why do you need it? What does it do? What do you do with it? 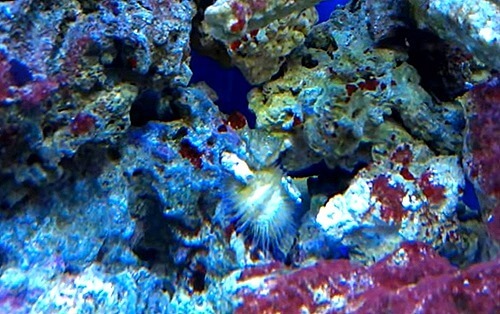 This article is designed to walk through the questions above and tell you how live rock should play a role in your reef or fish-only saltwater aquarium. What does live rock do for your reef tank? Why do you need live rock? Is live rock right for your tank? How much live rock do you need? Where should I put the rock? In simplest terms, live rock is the infrastructure of all coral reefs. It is the reef itself. Any scuba diver or even a casual snorkeler in a shallow reef has seen live rock and maybe even encountered the discomfort of walking on a beach of sharp rock. The stony structure underlying coral reefs is live rock. Ironically, live rock is not rock at all. It is the collection of calcareous skeletons of reef building corals. You may have heard reports of the continuous, albeit slow, growth of coral reefs — thousands of small organisms building structures that can be seen from space. The organisms primarily responsible for this complex structure are stony corals, encrusting sponges and encrusting algae. The corals grow by continuously absorbing calcium and building elaborate skeletons, layer by layer, year after year. The sponges and algae use the calcium to build layers of encrusted color over the surface of the coral skeletons. These creatures are helped and hindered by a multitude of other species that burrow in the calcium structure or rearrange it in one way or another. The result of all of this construction, destruction, burrowing and encrustation is a structure of calcium that comes in a range of shapes usually loaded with branches, holes and other shapes that increase surface area. This is live rock. When live rock is harvested and transported following sustainable and preserving collection practices, it will arrive at your aquarium full of life. The organisms on board (and within) the rock may include: macroalgae, coralline algae, corals, sponges, worms, crabs, shrimp, tunicates, anemones and a world of beneficial bacteria. These life forms are why the “rock” is called live. Filtration. Live rock is the best filter you will ever buy. The intricate and porous structure of live rock creates a tremendous surface area. 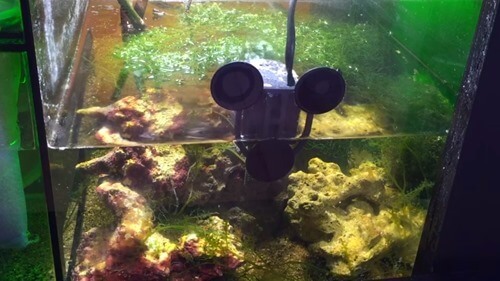 This surface area provides a home for extensive bacteria colonies (most of which are already in place when you obtain the rock), which are not only beneficial but necessary for your tank to survive. 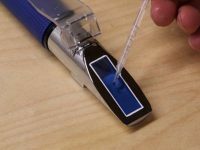 If you have not already done so, please read biological filtration for a discussion of the importance of nitrifying bacteria. Properly cured and in sufficient quantities, live rock can eliminate ammonia and nitrites (while keeping nitrates low) better than the most expensive wet/dry filter, fluidized sand bed or other man-made contraption. With enough live rock, you will have no need for any of these pricey and fallible devices. Water quality. In addition to providing basic biological filtration, live rock helps maintain higher water quality in known and undetermined ways. It can help maintain alkalinity and pH, can uptake nutrients like phosphates and silicates (turning them into attractive calcareous algae before they become nuisance algae) and is even believed to supply some trace elements. Yet even these chemical realities cannot fully explain the impact an ample supply of healthy live rock can have on a tank. Somehow, the inclusion of live rock in a marine ecosystem seems to contribute greater benefits than the sum of its parts can explain. Live rock tanks are just healthier. Food. Live rock also provides a natural and plentiful food source for grazing marine fish like angelfish, butterflyfish and tangs. In fact, some fish, like parrotfish (which should not be kept by any but the most experienced aquarists), absolutely need a supply of healthy live rock to survive. Shelter. Live rock also provides a natural environment for fish, simulating the holes and caves in which they take comfort in nature, and for the many inverts and micro-inverts that will help maintain and clean your tank for you. The simple answer is you don’t. Despite all the benefits of live rock, you can maintain a fish only tank without it. For decades, aquarists have maintained tanks of dead coral, artificial decor, dead substrate and fish. While this is not even close to a replication of nature, hardy fish can survive such a setup. However, whether you are keeping tough triggers and eels or delicate butterflyfish and a prize Conspiculatus Angelfish, live rock will improve the quality of life for all of your specimens and will allow you to maintain a greater variety of fish and non-fish life. 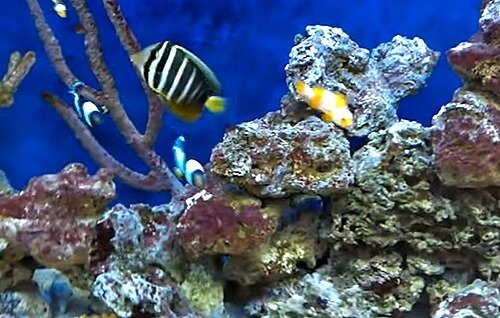 In addition, if properly provided the right aquarium lighting, low nutrient levels and a balance of calcium and alkalinity, live rock can quickly become 100% encrusted with coralline algae in a variety of pinks, purples, orange, red and white — adding dramatically to the aesthetic appeal of the aquarium. There is not a marine setup imaginable that cannot benefit from live rock in the system. 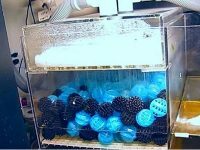 While it is not essential to maintaining a basic fish-only system, it will help and should be one of the first additions to a startup tank. In a word, yes. It does not matter what type of setup you have – reef, fish only, community, aggressive – live rock is a good addition. New hobbyists often ask whether they can keep live rock with fish like triggerfish and parrotfish. Some are concerned that such fish may kill the live rock. Suffice it to say that live rock, since it is not an organism itself, cannot be killed. While a parrotfish will bite pieces of the rock off and crush them to find food (as the unpredictable triggers may), this will not affect the rest of the rock. Unless the fish is dramatically crowded into a tank with too little rock, it would take a parrotfish years (longer than it is likely to live in captivity) if not decades to reduce a discernible amount of live rock to rubble. All the while, the process would provide a tremendous boost to the substrate. A hobbyist placing live rock in a tank of non-reef-safe fish might genuinely concern himself or herself with the organisms on the rock. To be sure, in a tank of triggers, any shrimps, crabs, urchins or snails would likely become quick meals. Likewise, angelfish and butterflyfish would likely decimate any coral polyps on the rock, while a group of tangs might make quick work of the macroalgae. This is not to suggest live rock should not be placed in tanks of such fish. To the contrary, the rock is serving an essential function of providing food to the fish in a natural way. The rock will thrive without its stowaways. This is a commonly asked question. Equally common is the rule-of-thumb answer – 1.5 to 2 pounds per gallon. While this is a good guideline, there is no answer. Essentially, you should add enough live rock to make the tank look appealing, to provide enough cover for shy fish, to feed grazers and to provide ample biological filtration for your stock list. While 1.5 to 2 pounds generally suffices, a heavily stocked tank may require more, while a lightly stocked tank can get by with less. The only rule I would suggest is that if, and only if, the tank looks good and you have never a trace of ammonia or nitrite, then you have enough live rock. Locating live rock may seem like a simple proposition – put it in the tank. However, there are other options. While a tank loaded with beautifully encrusted live rock makes a spectacular display, some hobbyists prefer the look of artificial decor. 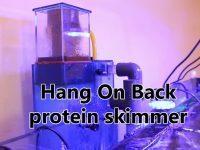 Assuming you are not keeping fish that need the live rock available for constant grazing, you can have the best of both worlds by decorating the tank with the sterile decor of your choosing while tying the tank into a sump full of live rock. Such a sump should be lighted at night to maintain stable oxygen, carbon dioxide and pH levels. Such a sump might also include a plenum. Virtually all live rock is collected overseas and shipped dry (covered with wet newspapers to preserve some moisture). During shipping, some of the life on the rock will die. If you were to immediately place it in an established and stocked tank, the dead organisms would produce tremendous quantities of ammonia and poison other livestock. Livestock (and other organisms on the rock) would then die and add to the ammonia causing a downward spiral. To prevent this problem, live rock should be cured before placing it in a stocked tank. Curing, in its simplest terms, consists of placing the rock in a suitable environment where the living organisms can survive and the dead or dying organisms can die off fully, breakdown into ammonia and be converted into nitrates or nitrogen gas. Usually, the curing process takes from 4 to 8 weeks. Adding live rock to a tank depends on the rock and the tank. Is the rock cured, pre-cured or un-cured? Is the tank new or established? Cured. Cured live rock means the rock has been put through the curing process fully. It is alive. All dying organisms are gone. It is ready for a stocked tank. If you buy fully cured live rock from a local store, you can safely add it to a stocked and established tank. It may still cause a slight ammonia spike but the spike will be short-lived and minor. If you buy fully cured live rock shipped to you, it will suffer some losses in shipping (unless it is shipped in water, which is uncommon and very expensive) and should be re-cured at home before adding it to your tank. Fully cured rock will usually re-cure in a few days. An ammonia test showing no trace of ammonia in the curing container tells you when the rock is ready. Pre-cured. Pre-cured rock should not be confused with cured rock. It is not cured. This description merely means that the rock was placed on dry racks and sprayed with saltwater for several weeks before shipping. 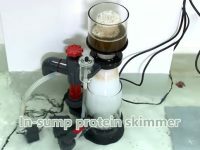 This process purportedly removes harmful mantis shrimp and bristle worms (not all bristle worms are harmful) while preserving the beneficial life. This is not a curing process and such rock should be fully cured upon arrival. Un-cured. Un-cured rock is, as its name suggests, not cured at all. It is plucked from the ocean and sent to you. This rock contains the most life but much of it will die in curing. This rock absolutely must be cured before adding it to an established tank. If you have ever considered adding uncured or pre-cured rock directly to a stocked tank, think again. These burrowing worms are just one of the many life forms hidden within live rock. Chances are high that by the time the rock reaches you, many of the hidden animals have died or are in the process of dying. Even if the rock looks and smells perfect on the outside, placing it in a display tank places large dying animals in the tank. The decay of these animals will provide a steady stream of ammonia and nitrite and risks causing other die off in the tank. Naturally, if you are considering adding a few small pieces of uncured rock to a well-established 500-gallon tank, the ammonia would likely be insignificant, but caution should be exercised whenever using uncured rock. Adding live rock to an un-established tank is a different story. The curing process of live rock also will cycle a new tank and is a great way to start a tank. Placing un-cured or cured live rock in a new tank and allowing it to cure in the tank is a sure-fire way to build a strong biological filter bed and prepare your tank for fish, corals and other inverts.